I get asked this question fairly often by people who are outside of our community - those who haven't heard of Airsoft, nor played it can't quite wrap their heads around why you would willing put yourself in a position where you could get shot with an Airsoft gun - after all we've all seen the pictures of what damage those dodgy Seaside market BB guns are capable of! In all fairness to them, when I first heard of Airsoft I immediately thought 'doesn't that hurt?! Why would anyone put themselves through that willingly?!' and thought you'd have to be pretty crazy to play such a sport! Then I played Airsoft and everything changed. In this article I will tell you exactly why I play Airsoft and what I love most about the sport! I also asked my fabulous Instagram Followers for the reasons they love Airsoft so much and those will be featured in here. Now at first glance I am an unlikely candidate for an Airsofter, and my sporting history is not something I would shout from the roof tops. I'm relatively small - 5"4 and weighing around 8st, I'm very girly - opting for dresses and heels at every opportunity and I am not that fond of the outdoors (mud and bugs are just not my thing!) My sporting history has never been that impressive, at school I would choose the 'easy choice' and always got my Mum and Dad to write me a 'sicknote' so I didn't need to do swimming or Javelin throwing haha! There is something different about Airsoft that you just don't get with other sports, the camaraderie, the gear, everything! The first reason I would say definitely keeps me coming back to Airsoft is the people. I have made some, what I hope to be, lifelong friends through Airsoft, both in my team and also the UKAC. You can meet so many people and make many new friends. 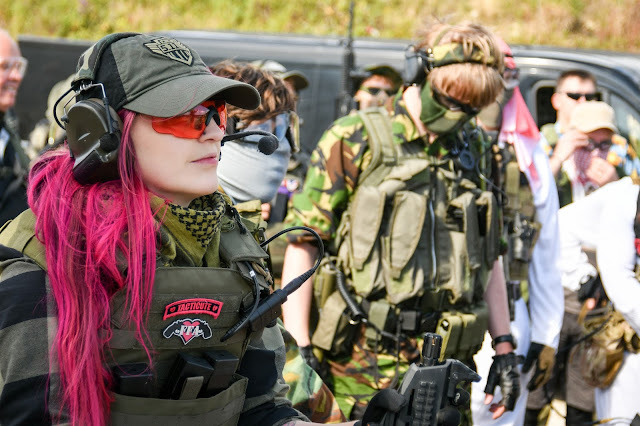 Airsoft brings people together in a way I haven't observed much in other sports! The banter flows and everyone is really welcoming whether you are a new player or an experienced one. This reason is echoed throughout my following base with @outfoxedairsoft, @aliciapasaye, @4evapanda, @theairsoftprincess, @doomcrewairsoft also giving this as the thing they love most about Airsoft, it's well known that a day of skirmishing is 60% social and 40% actual Airsofting. Reason number two - The adrenaline! One of the things I love about Airsoft is that surge of adrenaline you get when you are the last one left on your team in a defender game and you're holding everyone off knowing at any minute you could be taken out, or when you are taking point, leading your squad through a tight building knowing an enemy could be right around the corner. Terrifying stuff! I love getting so pumped that when you get back to the safe zone to bomb up your mags and your hands are shaking so much from the Adrenaline your beebs are dropping everywhere. I love that feeling, the hunt, the 'kill' and everything about. Reason number 3 - The kit! There is so much to choose from and your gear is never complete, there is always something to add to make it even more perfect. @2265tactical, @hans198313 said this was their favourite thing about Airsoft - including things such as getting a stock weapon and making it completely unique to you. Then there are other reasons, that are so funny I have to share with you! From @kieran_tonge: 'Playing dress up', @remf_tacticool: Writhing around in piles of multicam gear like a pig in a cool muddy puddle on a hot summers day. @griffdogactual: raining plastic and my personal favourite from @paw_jr_airsoft: Shooting family when they are on opposite teams!